A Bath-based business innovating the way plastic car parts can be repaired is seeking investment to take it to the next level. 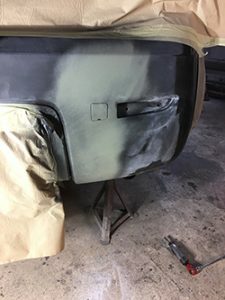 Pinweld, based at the University of Bath Innovation Centre, is exploring the use of precision weld technology to fix plastic bumpers and other parts that are easily damaged but expensive to repair. It has already received substantial interest from the UK automotive repair sector including workshops, national franchises, insurance companies and automotive trade associations. At present cracked plastic car bumpers and under-bonnet parts are replaced rather than repaired – with a significant financial and environmental cost. ength of the original in a fraction of the time, and at far lower cost, than the current processes. Pinweld has already been helped by the University of Bath’s Sustainable Technologies Business Acceleration Hub (STBAH) programme. Funded through the European Regional Development Fund (ERDF) and supported by Bath SETsquared and the University of Bath, the programme provides fully-funded business support through mentoring, workshops and collaboration opportunities. As technology development was key to Pinweld, research collaboration opportunities were soon made through the university with materials scientists and engineers assisting with testing and trials. The analysis of this data was then subsequently used to help with grant funding applications. The business has already received financial support from an angel investor but is looking for additional funding through a third round of investment to support prototype development and production. The firm has also recently appointed Antony Pullen as chairman and CEO, bringing with him a wealth of senior international strategic, commercial, operational and merger and acquisition experience in the FMCG (fast-moving consumer goods), B2B and automotive sectors, including at The Coca Cola Company, Experian and Koenigsegg, the Swedish sports car manufacturer. He said: “This innovative technology is going to have a significant beneficial impact on the automotive repair market. It quickly, reliably and efficiently mends plastic under-bonnet components and body parts, which today are simply discarded as a matter of routine. Pinweld founder and chief technology officer Keven Chappell devised a reliable method of fixing cracked plastic panels using a novel form of plastic welding in the mid-1990s while in aerospace and also a keen motorcyclist. Two decades later, having moved from engineering to retrain as a maths teacher, he used his old designs to repair bike fairings, car headlight brackets and other plastic items to earn extra money. Individuals and subsequently businesses became interested in making use of the service, so he started a business. Other appointments to the Pinweld management team are chief operations officer Paul Albone and chief commercial officer David Wright, who said STBAH’s support and introductions made via the university had been invaluable and helped kick start the business. STBAH entrepreneur in residence Pete Keevill first met Keven a year ago to discuss the project and how the STBAH could help. Pinweld is developing its products using patented precision polymer weld technology suitable for the repair and original manufacture of high-value plastic components. The technology can be applied to a wide variety of polymers, including those that are difficult to recycle.